Exterior Insulation and Finish System (EIFS) is an exterior wall cladding that provides exterior walls with an insulated, water-resistant, finished surface in an integrated composite material system. It utilizes rigid insulation boards on the exterior of the wall sheathing with a plaster appearance exterior skin. Its insulating qualities to reduce thermal loads on the exterior building wall. EIFS protects against moisture infiltration at the base coat; however, moisture has entered the wall system at these locations and caused damage to the wall sheathing and framing. Moreover, moisture migration through openings of doors, windows, flashings, and other items, or holes and cracks in the EIFS itself, have allowed leakage to occur on EIFS clad buildings. They are light in weight, low cost, and the system can be sculpted into shapes and patterns to achieve different aesthetic effects. – Wall drainage EIFS systems are similar to cavity walls; the installation is over a weather barrier behind the insulation that acts as a secondary drainage plane. The weather barrier must be properly flashed and coordinated with all other portions of the exterior wall to prevent water from migrating into the underlying walls or interiors. – The back-up for absorptive coating; the high-density polyethylene that provides dual-sided drainage is used to make the impermeable membrane, a complete capillary break, and drying capacity. Its simple double-sided design ventilates the cavity and allows moisture to escape. The model of delta-dry advanced ventilated rain screen is the secret behind absorptive cladding such as manufactured stone, stucco, and natural stone. Its installation is between exterior sheathing and cladding to protect structures from water intrusion. – Ventilate brick walls; combat the effects of mold, spalling, and efflorescence with the Brick Vent moisture control system. It wipes out moisture and provides ventilation for drying masonry walls quickly. Although it does not require additional mortar blocking products, the system accommodates a wide variance in the gap between the structure and the brick. – Keep substrate dry; waterway Rain screen Mats use a proprietary filter fabric that performs like an extra layer of house wrap. This material surpasses water hold-out requirements for weather-resistive barriers and creates space for continuous ventilation and drain water faster than standard stone installations. – Allow water to drain; L+R Weep Screed (LR 3501) is designed to accommodate a rain screen drainage plane material and “weep.” This metal termination forms the bottom edge of the scratch coat and the thin-set mortar. Large 1-in. Slots along the bottom edge allow moisture to exit a thin veneer wall system. The addition of the Weep Screed Deflector (WSD 1309) helps to direct moisture away from the foundation. – Prevent moisture problems; Drywall Rain screen’s entangled net design eliminates related moisture problems in most exterior veneer applications, including plank siding, stucco, manufactured stone, and vinyl. The full wall product rolls over the weather-resistant barrier to separate it from the exterior veneer. It creates a space that increases airflow through the wall cavity, allowing the wall to breathe and stay dry and mold-free. – Create space; the design of Mortar vent two-ply mortar deflection and ventilation system used with manufactured stone, stucco, EIFS, and brick. A polymer core mesh creates air space between the weather-resistant barrier and exterior wall, while the filter fabric blocks mortar droppings from seeping into the wall cavity. Moisture can still pass through, ensuring dry airspace. 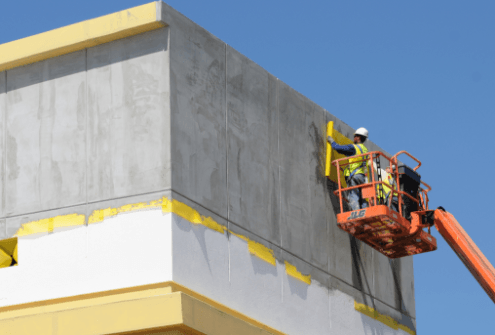 For effective functioning of the EIFS wall system apart from just following the manufacturer’s instructions, proper inspection and maintenance should be done on a regular basis to avoid any moisture or water leaking into the system. EIFS wall systems rely on insulated foam board and wall cladding to produce superior protection from the outside elements. These stucco systems help to keep buildings controlled, comfortable, and dry from external moisture. EIFS has become the stucco system that more buildings depend on each day. However, just because it is the current industry standard doesn’t mean that everyone offers the level of quality that you deserve. Our contractors are fully trained in EIFS installations and repairs, as well as receiving full certification in providing better services. When you need to know that your EIFS was installed right, you need us for your building.